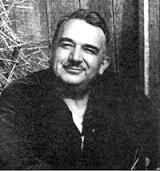 A versatile, award-winning writer in many genres, Manly Wade Wellman (1903-1986) was born in Angola, West Africa, the son of a medical officer. He graduated from what is now Wichita State University, and earned a bachelor of laws degree from Columbia University. He worked for several years as a newspaper reporter before becoming a free-lance writer. He moved to North Carolina in 1947, settling in Chapel Hill because of the resources available at the University of North Carolina. On his eightieth birthday, Wellman announced, “Today is my eightieth birthday, and I’ve written eighty books. That’s pretty good, don’t you think?” He wrote thirty-five adventure novels for boys, nearly half of them set in North Carolina in the southeastern part of the state, and in the mountains. These include both contemporary mystery/adventure stories and historical novels. Like his juvenile books, Wellman’s adult writings are a mix of history, biography, folklore, fantasy, mystery, and true murders. Although his work has been called “science fiction,” he successfully blended his varied interests to create a genre now referred to as speculative fiction. His fascination with Appalachian history and folklore form the basis for his fantastic Silver John series, which features a virtuous folk-ballad-singing young hero who battles supernatural forces of evil in the North Carolina mountains, defending the innocent and timid. Wellman’s numerous works of speculative fiction also include a Martian murder mystery, tales of loathsome alien invaders, and Twice in Time, the story of a man who falls into the fifteenth century and becomes Leonardo da Vinci. North Carolina’s first, and for many years preëminent writer of speculative fiction, Wellman generously extended aid to emerging writers, teaching classes in creative writing in the Evening College of the University of North Carolina and guiding many of his students to fruitful careers. The younger writers who competed with him in his last years always acknowledged him with great admiration and respect. In 1955 he won the Mystery Writers of America’s Edgar Allan Poe Award for nonfiction, and was awarded the North Carolina Award for Literature in 1978. North Carolina Literary historian Richard Walser has speculated that Manly Wade Wellman’s first Silver John book, Who Fears the Devil?, will be one of the five North Carolina books people will still be reading a hundred years from now. Buy this book from your local bookseller or from Amazon.com.